Bipartisan Problem Solvers Caucus members met with Trump at the White House. The meeting with both Democrats and Republicans comes the day after the president invited a group of rank-and-file Republican and Democrat members to the White House for lunch. No Democrats took the White House up on that invitation, which was viewed on Capitol Hill by some as an attempt by the White House to create fissures within the Democratic Party – though House Speaker Nancy Pelosi gave approval for Democrats to accept Trump’s invitation. Democrats remain united in their firm opposition to building a physical barrier along the southern border and have said they will not negotiate with the president on the issue with the government still partially shuttered. Talks between President Trump and Democratic congressional leaders broke down a week ago when Trump walked out of a meeting with top Democrats after Pelosi told the president she would not be willing to cede to the president’s demand for wall funding if the government reopened. 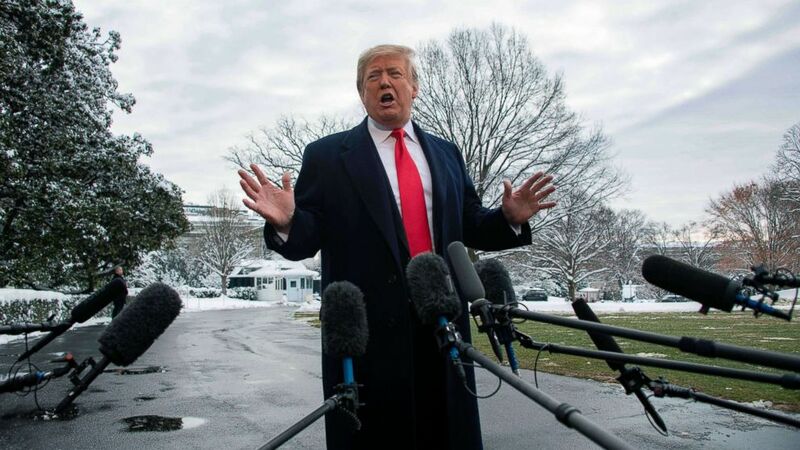 (Jim Watson/AFP/Getty Images) President Donald Trump speaks to the media as he departs the White House, Jan. 14, 2019, en route to New Orleans to address the annual American Farm Bureau Federation convention. The seven Democrats who attended Wednesday’s meeting released a statement as they arrived at the White House saying they accepted the president’s invitation in order to relay their message that the government must be reopened as a precondition for further in-earnest conversations. "There is strong agreement across the aisle and around the country: We must reopen the government. Our security, safety, and economy have been compromised, and millions of families are suffering,” the Democrats said in a group statement. "There is also strong agreement that if we reopen the government, the possibility exists to work together and find common ground to tackle some of our country’s toughest problems and fix them. But that conversation can only begin in earnest once the government is reopened." The Democrats included Reps. Josh Gottheimer, Thomas Suozzi, Vincente Gonzalez, Anthony Brindisi, Dean Phillips, Max Rose, and Abigail Spanberger. While President Trump remains dug in with his demand for $5.7 billion in funding for a southern barrier, the White House has acknowledged that the administration’s updated projection of the impact of the partial government shutdown on economic growth has worsened. 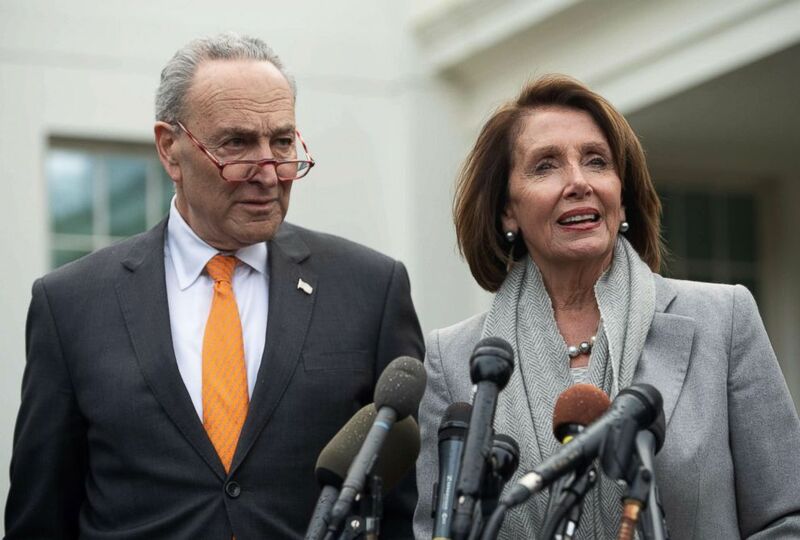 (Saul Loeb/AFP/Getty Images) Senate Democratic Leader Chuck Schumer and Speaker of the House Nancy Pelosi talk to the media following a meeting with President Donald Trump about the partial government shutdown at the White House, Jan. 9, 2019. The administration’s updated projection estimates the ongoing shutdown shaves off 0.13 percentage points each week off quarterly economic growth. The administration’s revised model includes both the estimated impact from those contractors that are not working because of the shutdown, as well as the 380,000 furloughed federal workers, according to an administration official. White House Press Secretary Sarah Sanders downplayed concerns about the negative impact of the ongoing stalemate on the economy, maintaining that the White House remains confident in the long term fundamentals of the economy and the president’s policies. And while President Trump said Monday that he rejected a proposal from his close ally South Carolina Republican Sen. Lindsey Graham to reopen the government on a short term basis to allow for time to negotiate, Graham said Tuesday night that he and a bipartisan group of senators were preparing to make a pitch to the president to do just that. Graham told reporters Tuesday night that the proposal would call for reopening the government on a short term basis, with a promise that within a "few weeks" they might be able to reach a viable solution that would meet his border security needs. "I’m hoping in the next 24 hours there will emerge a group of Republicans and Democrats who will basically ask the president jointly to give us a few weeks to work on this, with you, to see if we can produce a result in the Senate," Graham told reporters Tuesday night. "I would ask the President if that does come forward and there’s a critical mass of Republicans and Democrats asking for a period of time to work on this a short term CR, the president strongly consider giving us that opportunity," he said. Graham argued that by reopening the government for a limited period of time would provide the president with a better opportunity to get his way in increased funding for border security. "I can’t guarantee an outcome if you give us three weeks, but I can pretty well guarantee you’re getting nowhere quick doing what we’re doing," he said. ABC News' Mariam Khan, Ben Siegel, and John Parkinson contributed reporting.